Etosha National Park spans and area of 8,600 square miles and is home to both commonplace and incredibly rare species of animals. 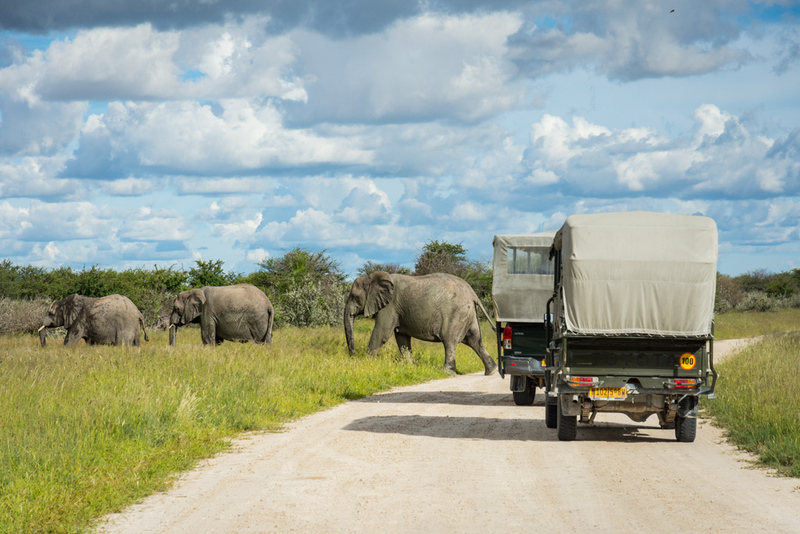 On your self-drive tour you may be lucky enough to spot elephants, endangered black rhinos, lions, giraffes, and possibly even leopards. And no doubt you’ll see plenty of zebras and antelope grazing right near the road. It is also home to more than 340 bird species including the ostrich and the flamingo. Early mornings, around sunset, and during the night are the best times to spot wildlife in the park. During the dry months the floodlit waterholes at the main camps draw nearby animals for an incredible viewing. 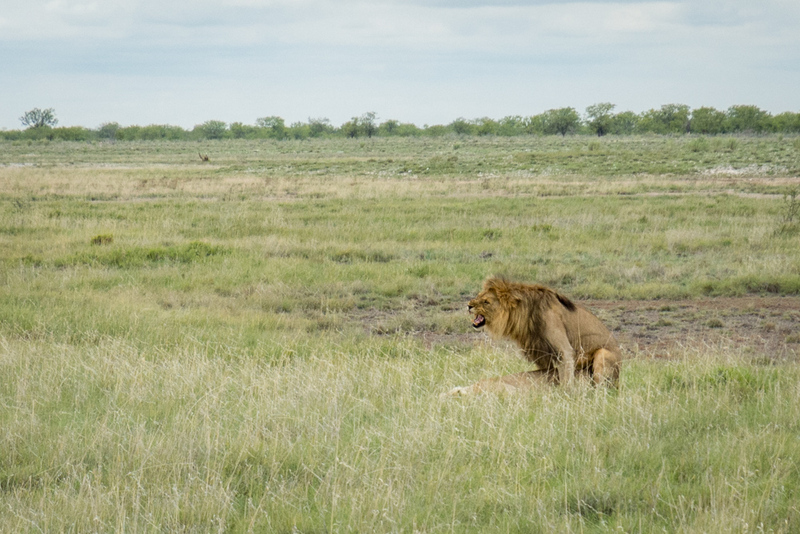 The lions of Etosha not only use the waterholes to hydrate but also to prey on unsuspecting animals. 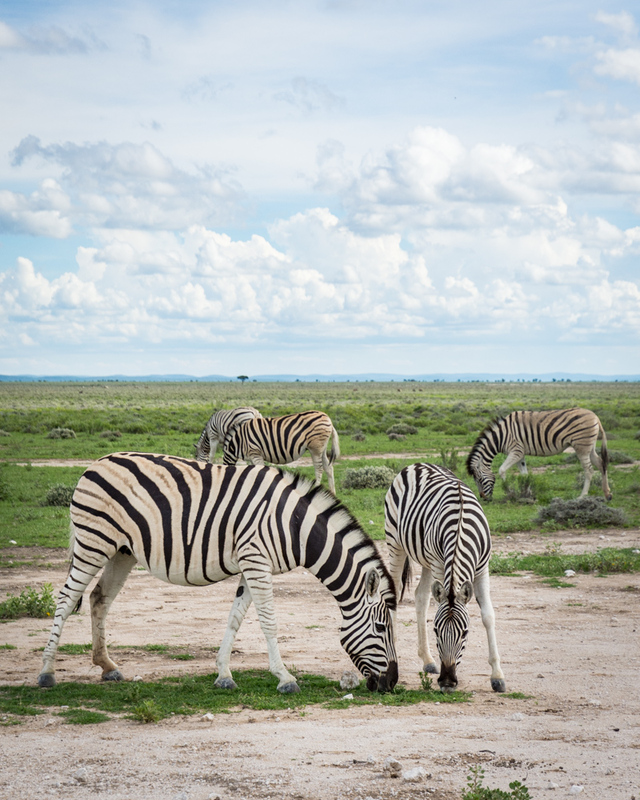 Etosha National Park is one of the top tourist destinations in Namibia so advanced accommodation bookings are recommended during the busy season. The more time you spend driving through the park, the better your chances for spotting wildlife! Namibia accepts two kinds of currency: the Namibian Dollar (NAD) and the South African Rand and they are pegged at the same value. At the time of writing (March of 2018) the exchange rate was 11.79 NAD to $1 USD. The only place in the park that is cash-only is the Galton Gate. However if you don’t have cash on you it is possible to pay your park entrance fee when you leave through another gate or at one of the campsites. 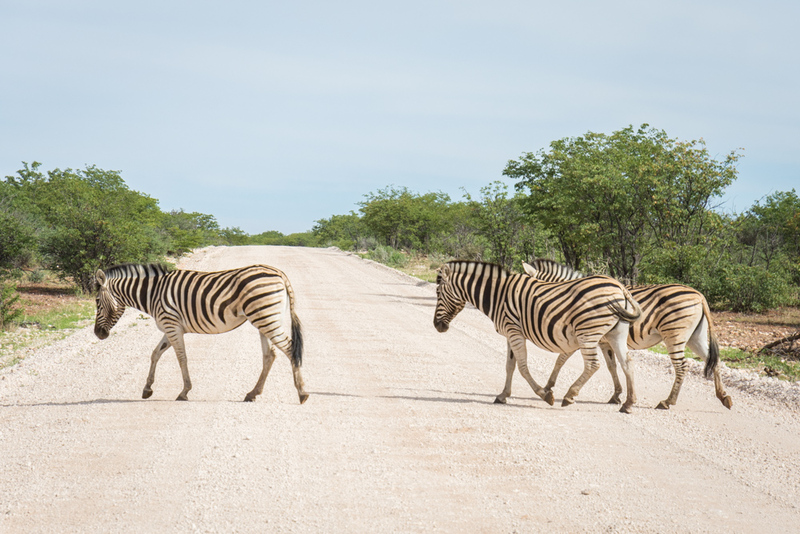 You cannot get out of your car in Etosha unless you are in one of the picnic areas or in the fenced lodge areas. Keep water and snacks in the front seat. 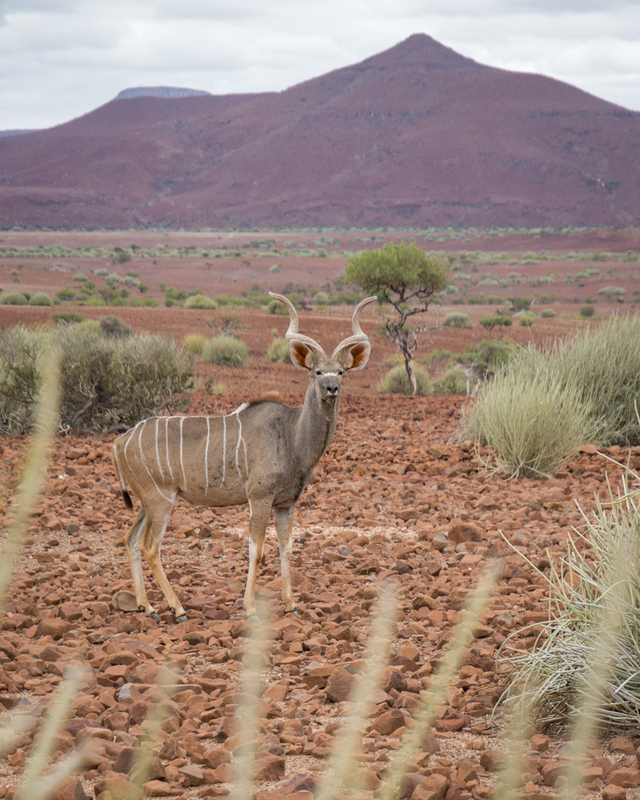 Namibia has a pleasant climate year-round but if you want to have easy access to wildlife gathered around the many watering holes, you’ll need to visit during the dry season – May to October. That is the busiest time of year in Etosha so be sure to book your campsite or lodge well in advance. 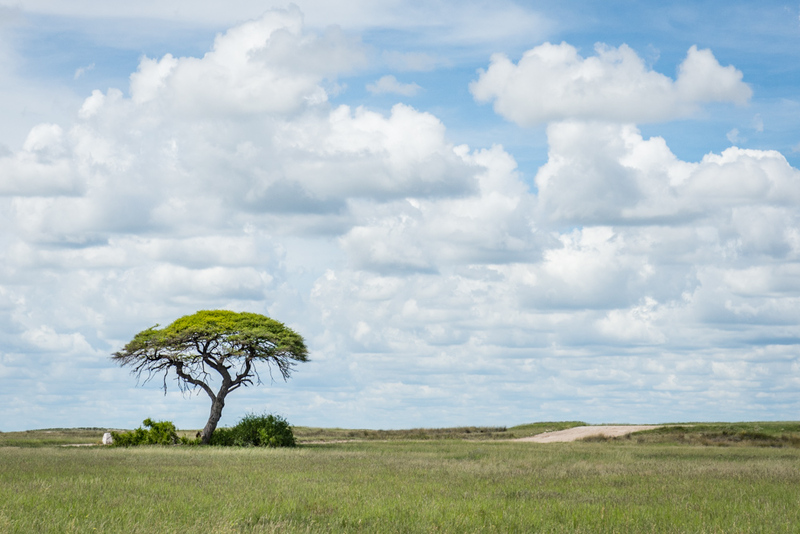 The wet season is a nice time to visit Etosha because there are fewer crowds and it’s easier to secure last-minute lodging. But the roads can be really rough and it can be more difficult to spot wildlife as they can find water all throughout the park. Read all about everything you should pack for your Namibian vacation here! There are 4 different entrances to access the park (outlined below). The southernmost Anderson Gate is approximately 260 miles from Windhoek which is where you’ll likely fly into and out of. Most of the campsites have small stores that sell a few necessities. Wine, beer, a few canned goods, snacks, and overpriced souvenirs to name a few. But don’t count on them for having everything you’ll need to cook your meals. 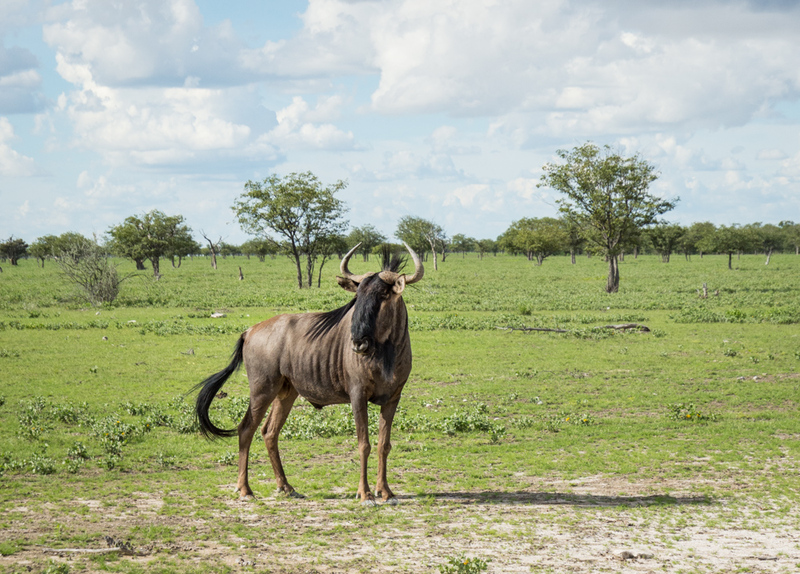 Note: Due to an outbreak of Foot and Mouth Disease in Northern Namibia, including Etosha, there were agricultural checks at all exit gates when we visited in March of 2018. No one was allowed to take raw meat or eggs out of the park. If you are planning on bringing meat to BBQ into the park, make sure you only bring as much as you need as you will have to throw any extra away before exiting. The gates to the park are open from sunrise to sunset. As are the gates to each campground. If you are found driving around the park before or after these times you’ll face a fine. You will also face a fine if you attempt to exit the park after sunset. There are four gates that allow access to Etosha National Park. Each gate has security guards and they will request to check your passport and sign you in. You’ll need to sign a form stating that you agree to follow the rules of the park prior to entering. Galton Gate – the western entrance to the park. They only accept cash for your entrance fee. While you may be able to pay by card when you leave the park, it’s better to bring cash just in case. The Galton gate is quite far from the lodges and campgrounds in the eastern region so make sure you give yourself plenty of time to traverse the park. If you don’t have enough time to cross the park, plan on staying overnight at the Olifantsrus campground or in a room at Dolomite Camp. Anderson Gate – the southern entrance to the park and the closest to Windhoek. It is also the most popular (busy) gate as it has the most services nearby – campgrounds, lodges, etc. Von Lindequist Gate – the eastern entrance to the park and the closest access point for the Namutoni Camp. King Nehale Gate – the northern entrance to the park. 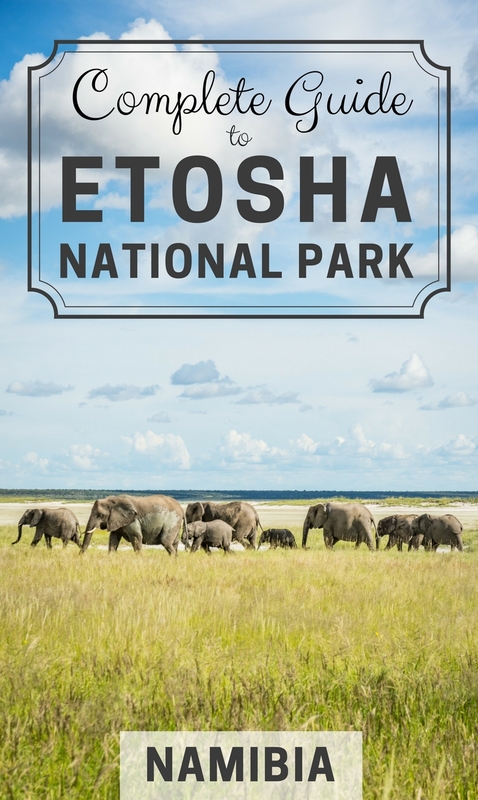 The fee to enter Etosha is 80 NAD/person per 24 hour period + 10 NAD/car. So if you enter at sunrise and plan to stay the night, you’ll probably want to purchase two 24 hour permits per person to give yourself time to exit in the morning. 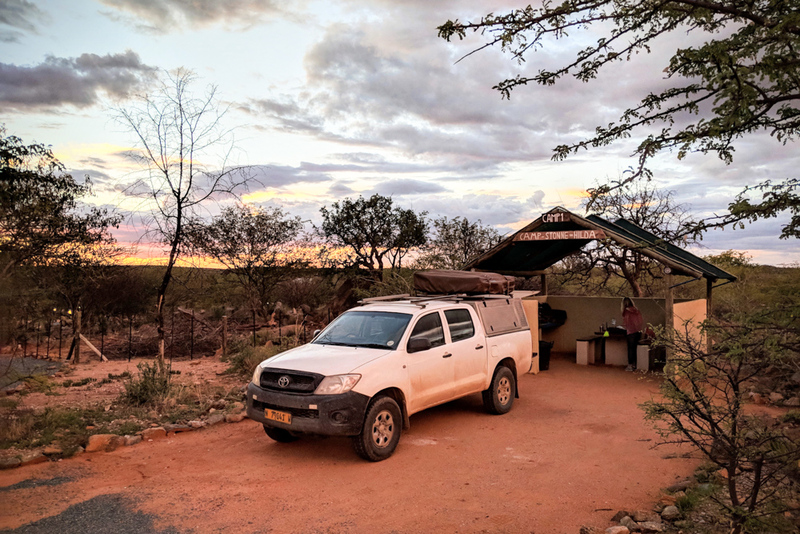 Do not get out of your car at any time in Etosha unless you are in a designated toilet or picnic site or in a campsite area. All of the campsites in the park are surrounded by electric fencing to keep animals out. Do not feed the animals. Rabies can be common in jackals and squirrels in the park. 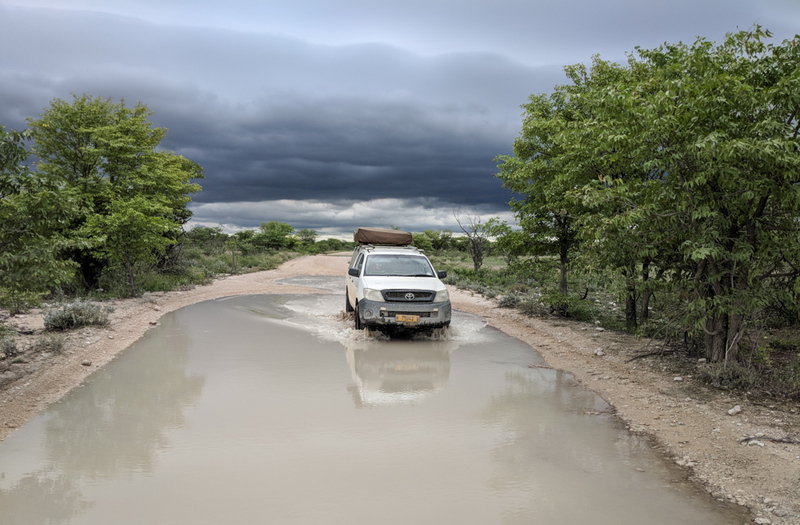 Most of the roads throughout Etosha are unpaved and can be rough, especially during the rainy season. Roads can have deep ruts and you’ll likely need to drive through several large puddles. A 4×4 vehicle is highly recommended. Make sure you check out our advice for renting a vehicle in Namibia. Once you are inside of the park supplies are limited. It is recommended that you fill up on gas and food prior to entering the gate. Most of the campsites have stores but the pickings are slim and expensive. They also tend to close early. And the gas stations don’t always have gas available. Better to be prepared. 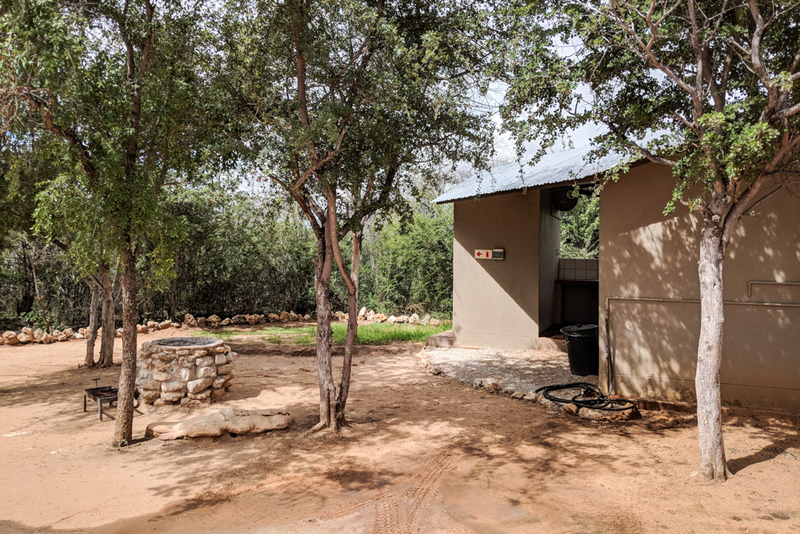 All of the campsites in the park are managed by Namibia Wildlife Resorts (NWR) and can be booked directly on their website. Keep in mind that they have limited space and often book out way in advance. If you don’t plan ahead there are also several options right outside of the park gates. One of the advantages of camping inside the park is that each campground has it’s own waterhole and viewing area. 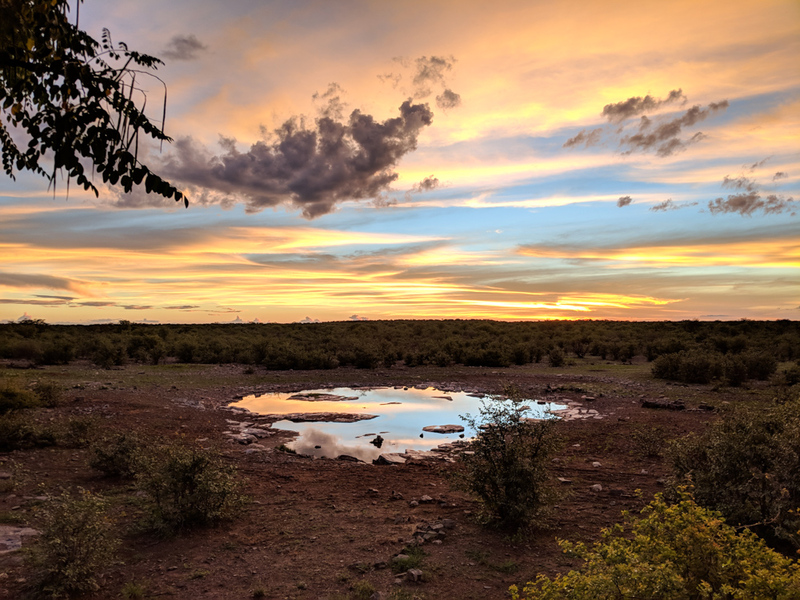 Sunset and sunrise at the camp waterholes offer prime game viewing opportunities as you aren’t allowed to be driving in the park during these times. 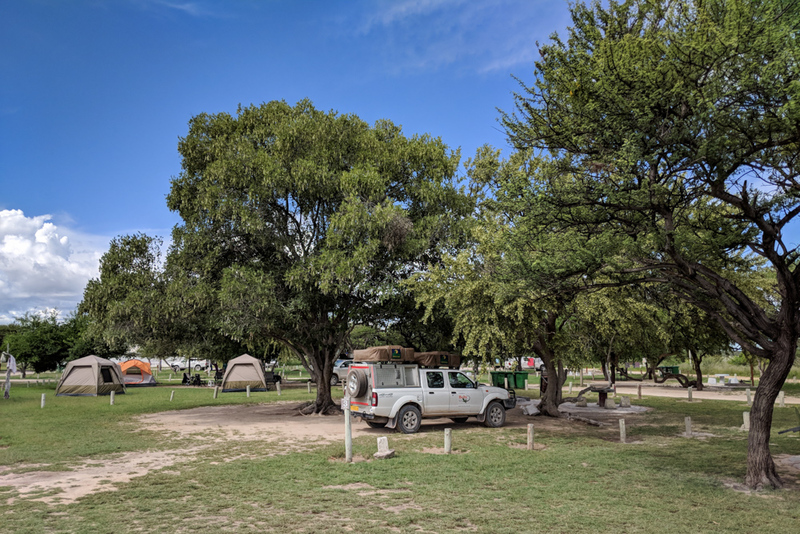 Olifantsrus is the only campground in the park that is not connected to a lodge. This makes for a much more rustic and authentic camping experience. 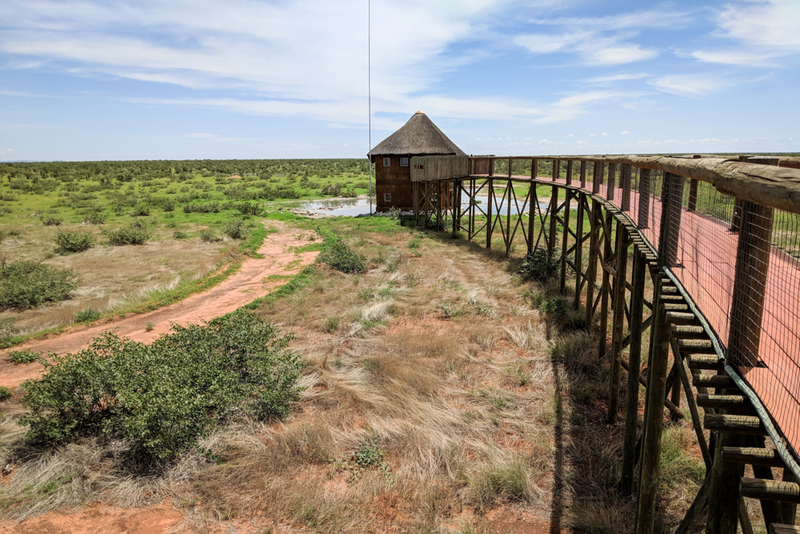 It also has an excellent covered platform overlooking the waterhole for amazing views of the animals from above. Camping Amenities: Each campsite has braai facilities and power is shared between every two campsites. 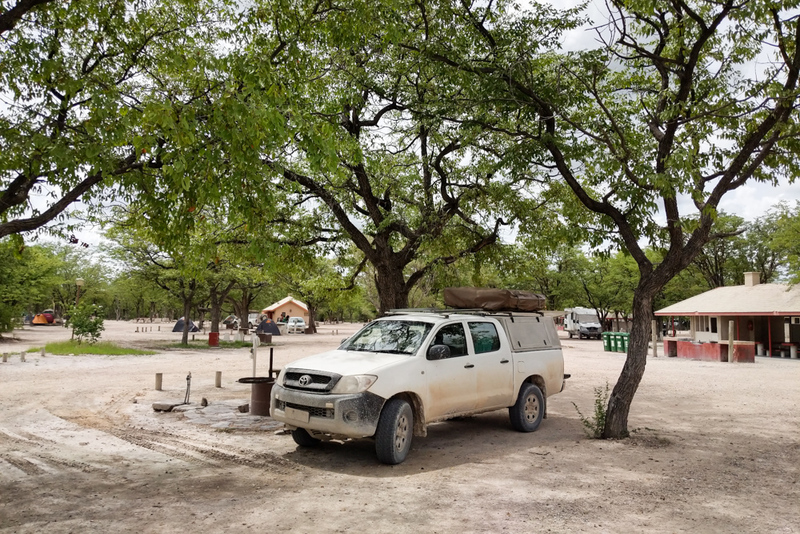 Okaukejo is the busiest campground in the park due to it’s proximity to the Anderson Gate (and Windhoek). 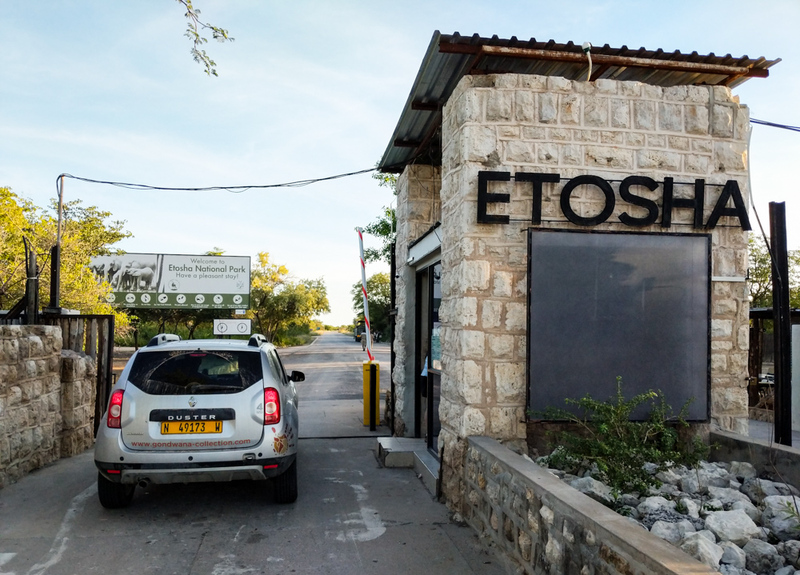 Almost everyone that visits Etosha passes through here at some point. Make sure to book your campsite in advance (or at least stop by in the morning to check availability) if you plan on staying here. Camping Amenities: Pool, restaurant, small store, hot showers, drinking water, electricity. 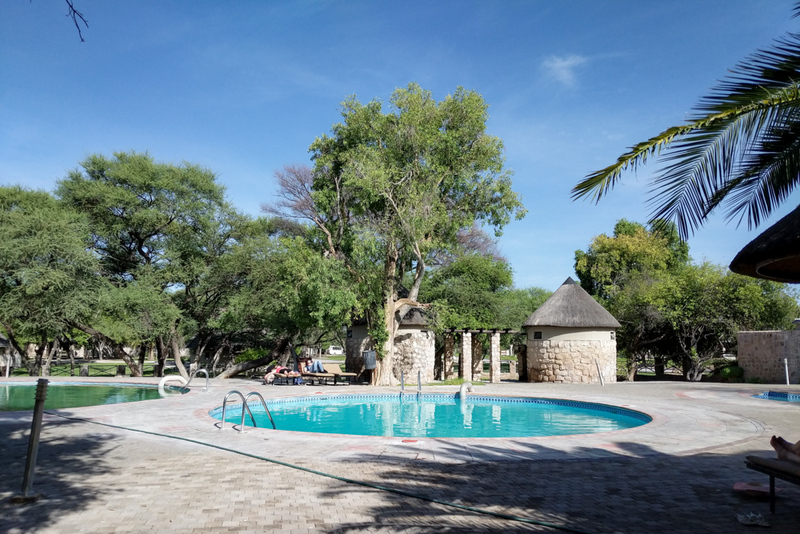 This is the largest campground in Etosha and due to it’s central location it provides quick access to many of the parks most popular waterholes. This is the nicest campground in the park as the sites are grassy and shaded. It also gives you access to an excellent viewing platform at the Namutoni waterhole. Camping Amenities: Pool, museum, restaurant, small store, hot showers, drinking water, electricity. 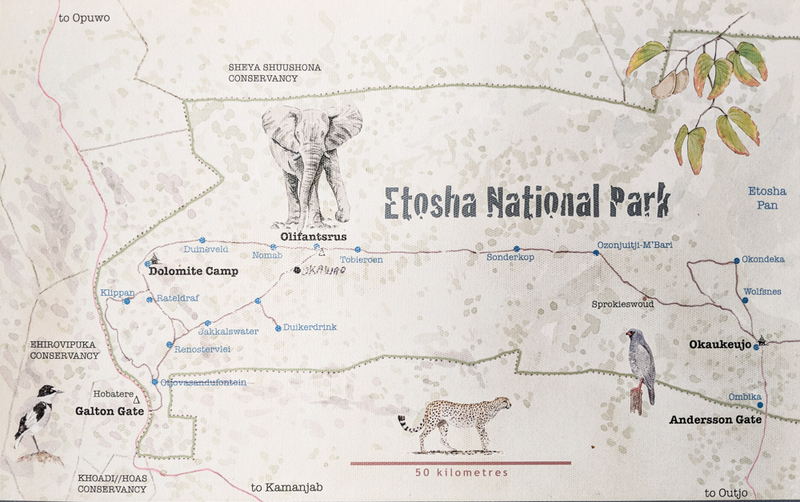 All of the campsites inside of Etosha are operated by NWR and tend to be expensive and run down. Wifi is an extra charge and the bathrooms rarely have soap or paper towels. However if you drive just outside of the gates of the park you can find campgrounds that are much nicer and less expensive. Camping Amenities: Campsite has ostriches that don’t seem to be frightened by people as well as a nightly porcupine feeding. It also has a swimming pool, bar, and restaurant onsite. Every site has water, electricity, and a covered kitchen area with lighting, a picnic table and a sink. This is a good place to get some laundry done as they also have drying lines. Camping Amenities: The campground has several animals caged onsite and they offer guided tours to see them up-close. You will also have access to the swimming pool, bar, and restaurant. Every campsite has water and electricity. Camping Amenities: Each campsite has it’s own shower, bathroom, and sink for dishes. 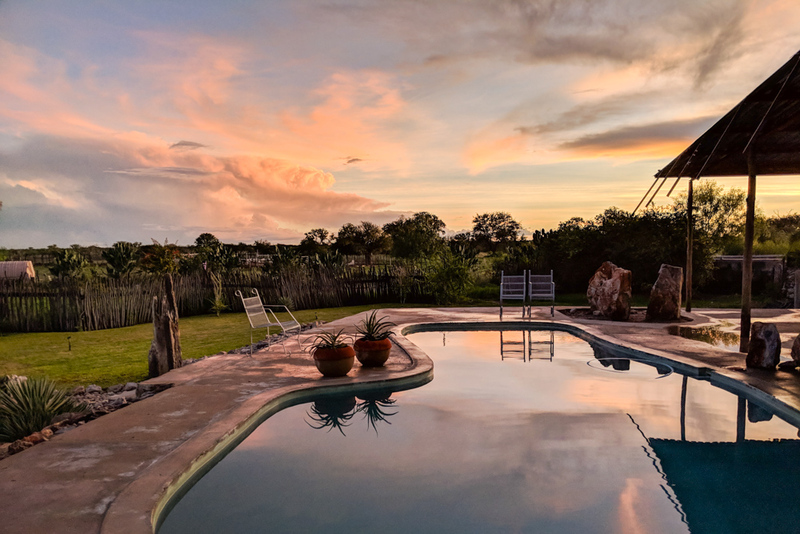 The campground has a small store with unique souvenirs, a restaurant overlooking a waterhole, and a swimming pool. There are a wide variety of animals present in Etosha. 114 mammal species and hundreds of reptiles and birds call it home. Early mornings and later afternoons are the best times to spot wildlife as they generally tend to lounge in the shade in the heat of the day. 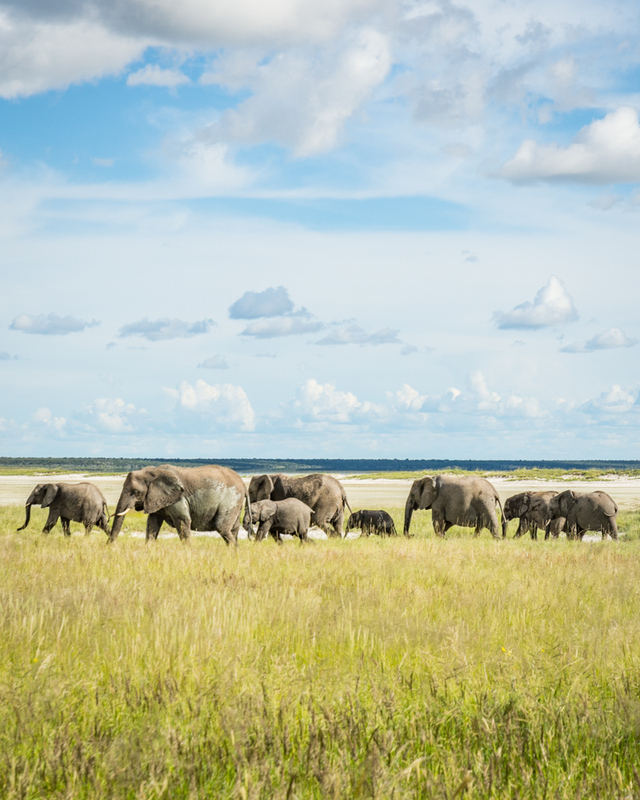 There are over 2,000 African elephants in Etosha. 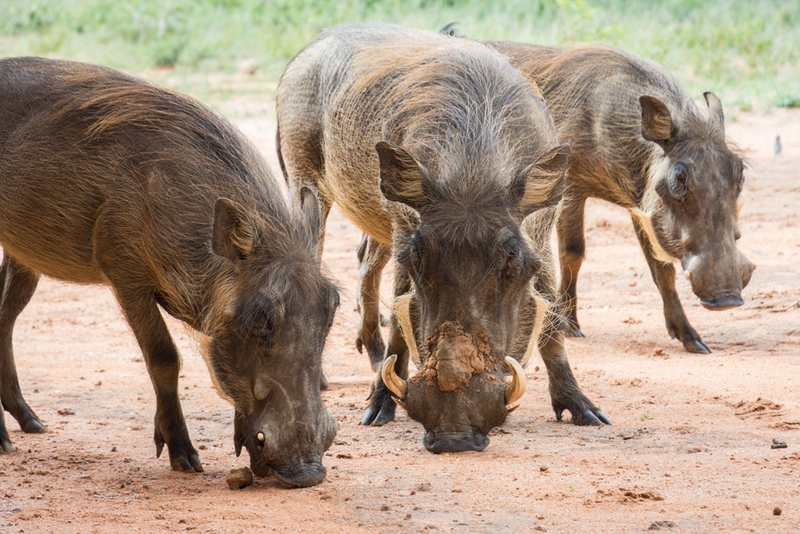 These animals generally travel in small family units of 10-20 so you’re more likely to spot several roaming together. The best place to spot African elephants are either at the waterhole at the Namutoni Campsite or on the roads heading north from there. You’re likely to see dozens of giraffes throughout the park, grazing near the road. 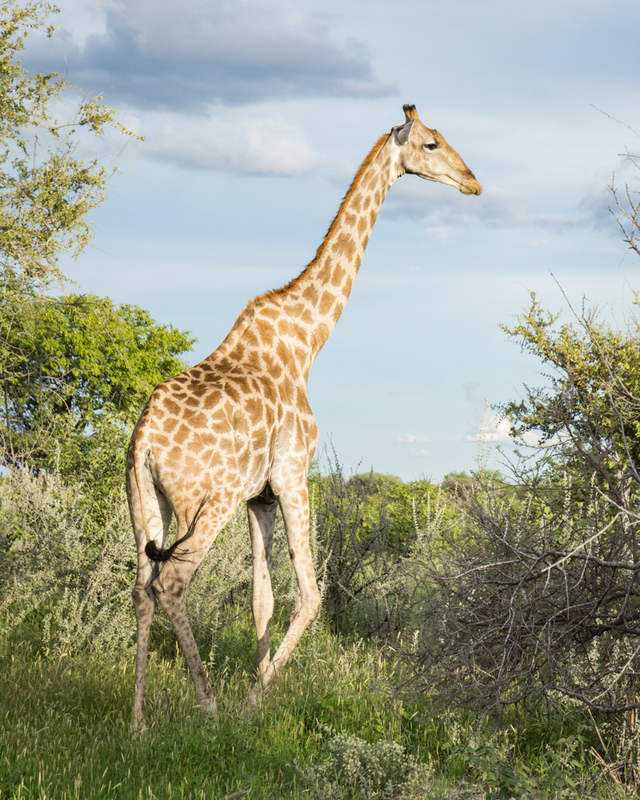 Being that they are the tallest mammal on earth, they generally tower above the surrounding vegetation. They are cautious around waterholes as this is where they are most vulnerable to attack by lions. 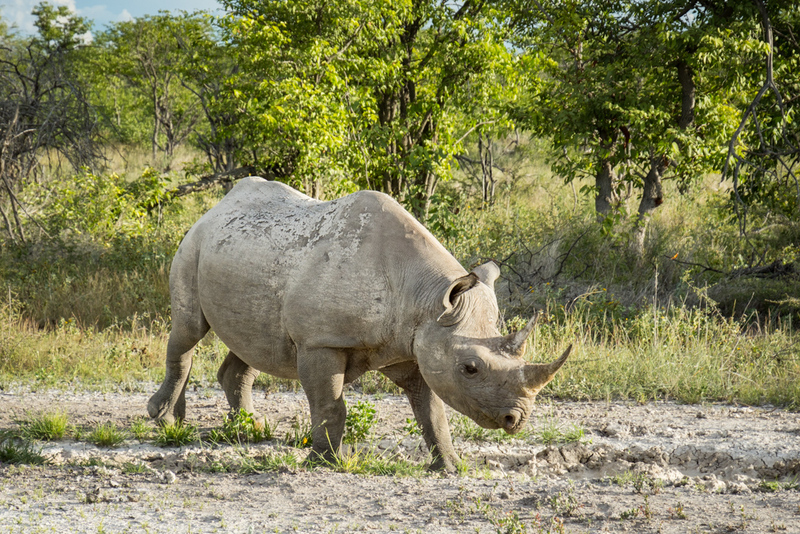 Black Rhinos are smaller than White Rhinos and have a hooked lip and a head held straight. Their numbers are currently stable due to conservation efforts in Etosha to protect them from poachers who kill them for their horns. They are very difficult to spot and generally only visit waterholes at night. White Rhinos have a square lip and hold their heads downward. They were introduced to Etosha in 1995. They tend to be easier to spot as they are more comfortable around cars and enjoy rolling around in mud puddles. You can recognize this species of antelope by their impressive corkscrew horns and white stripes extending down their backs. They can be seen grazing in open plains all over the park. This is the largest and heaviest species of antelope in Africa and are fairly uncommon to spot. If you stay at the Eldorado Campground there are several behind a fence near the road. 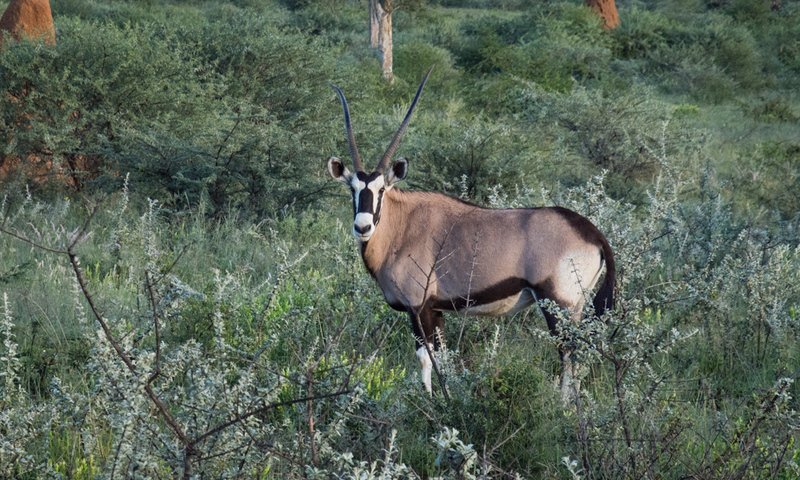 These once endangered antelope can be spotted by the black coloring on their faces. They are endemic to Namibia but they can be difficult to spot as they prefer to stick to the woodlands rather than the open plains. Only the males have horns. You’ll likely see hundreds of these around the park. They travel in herds and gather in open plains. 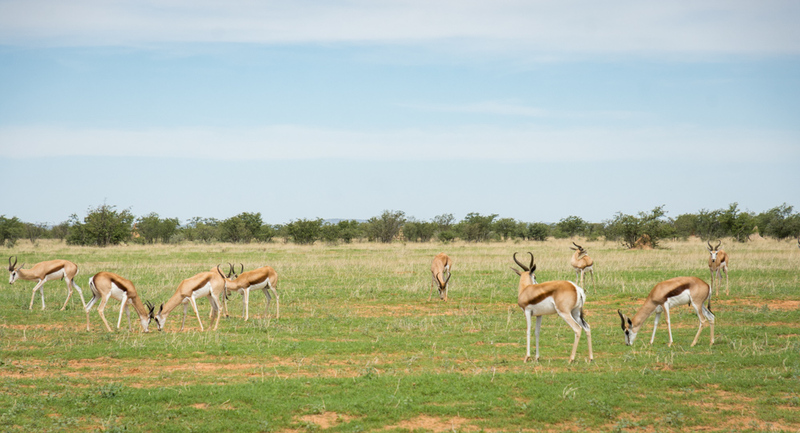 These are one of the most common antelope in Namibia and if you’re lucky you may see them “pronking” – they quite literally leap through the air. It is a unique move used to ward off predators. 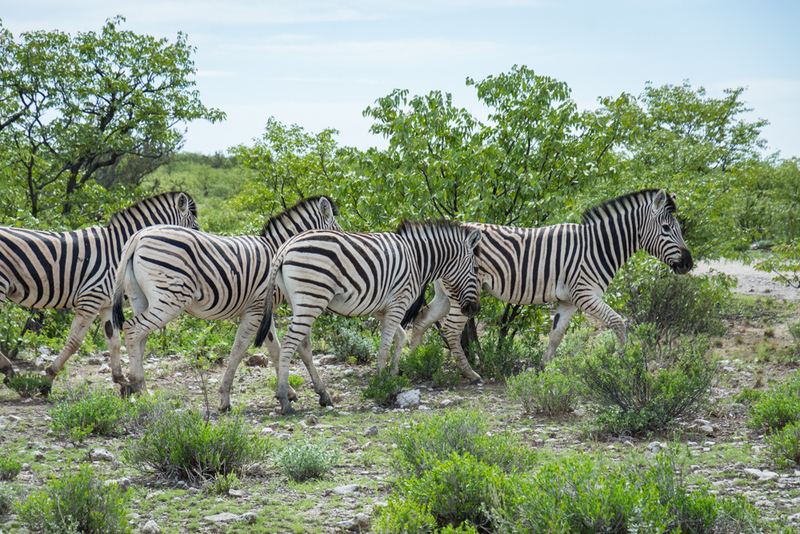 You can tell the difference between the two in that Burchell’s Plains Zebras have virtually unstriped white legs while the Hartmann’s Mountain Zebras have fully striped legs. They are also near-endemic to Namibia. These are wary creatures as they are a prime target for lions and leopards. 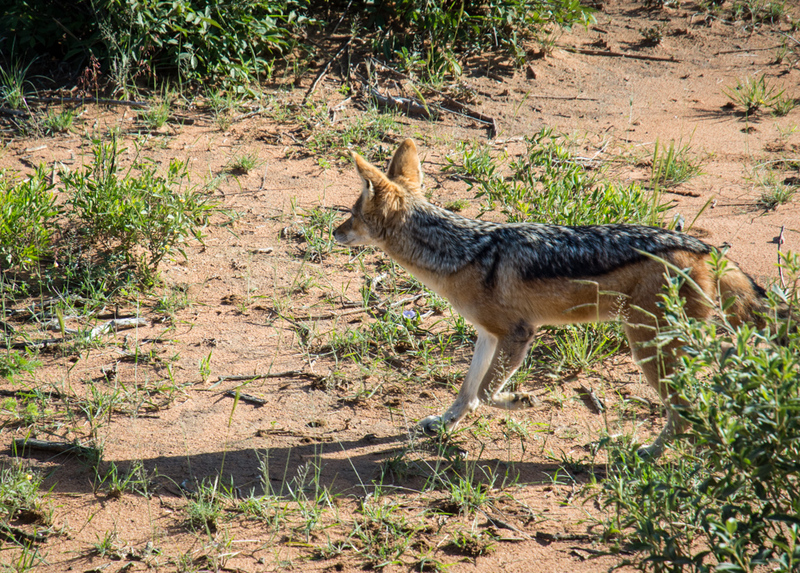 Those in Etosha are very skittish so you’re most likely to see them scurrying away from you, tail held straight up in the air. You’re likely to see quite a few of these magnificent creatures hanging solo in open fields or near herds of zebras. Sadly their numbers have decreased in recent years as they are prime targets for lions. 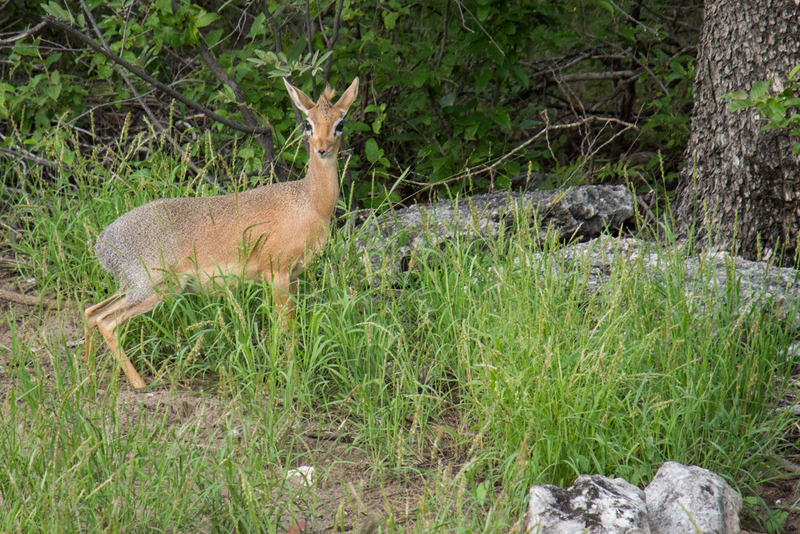 These can be difficult to spot in Etosha but can be seen hanging out around watering holes by day. They generally hunt after dark and primarily prey on zebras. They live in prides of 5-10 females, 2-3 territorial males, and their cubs. 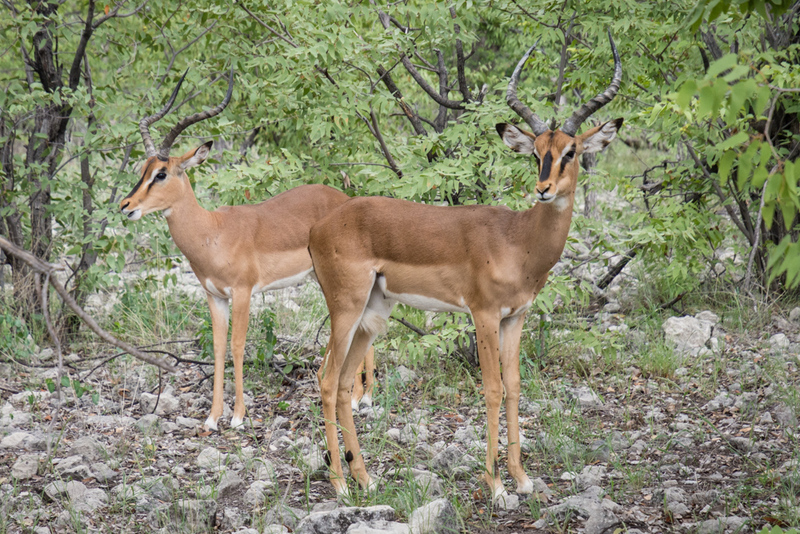 Sporting long, straight horns, these antelope can be seen frequently throughout Etosha. 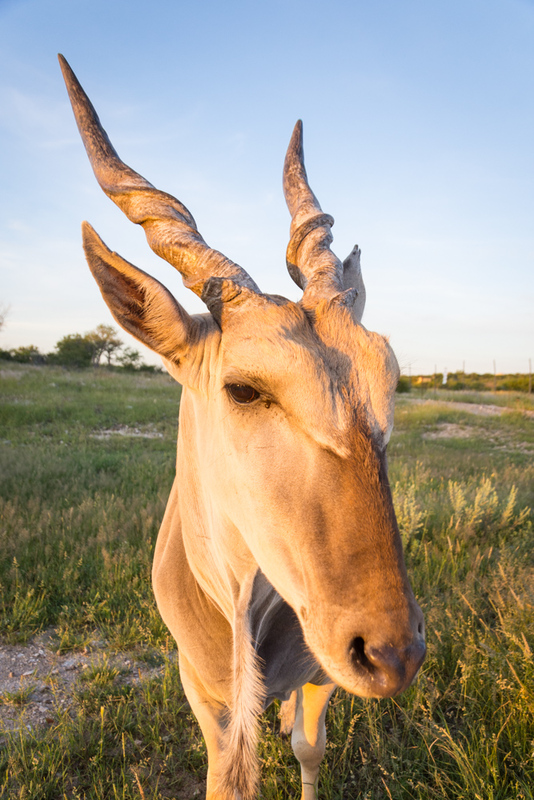 Females have longer, thinner horns than males. These may seem innocent when approaching your car but beware, many have rabies so don’t feed or touch them. They are generally scavengers but also prey on rodents, insects, and birds. 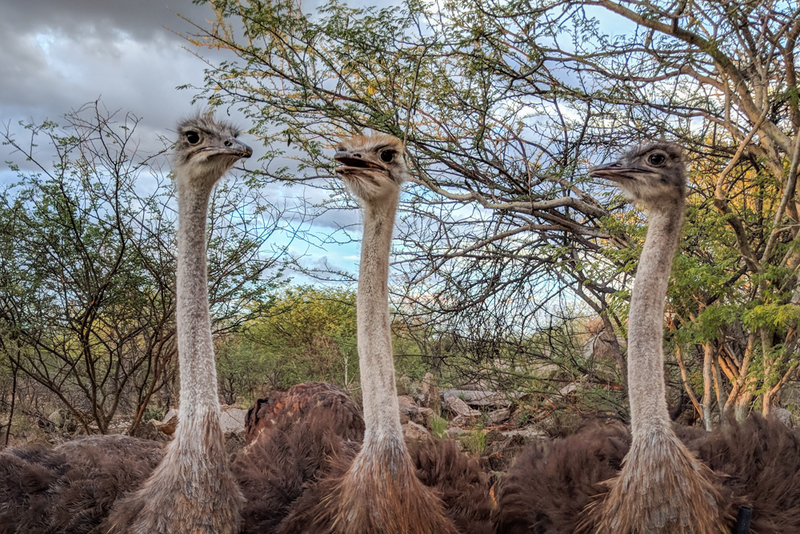 This is the world’s heaviest bird and they can be found throughout Etosha. These darling tiny antelope are the smallest in Namibia. They have large eyes and look almost like cartoons. They often stand motionless in order to avoid detection. Want more tips on traveling to Namibia? 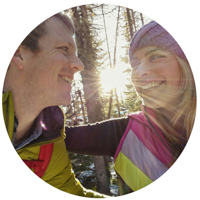 Read all about what to pack, what to expect when renting a car, and follow our recommended road trip itinerary!